American Indian Movement co-founder Dennis Banks arrives at Standing Rock as a police surround the main camps ahead of a Feb. 22 federal evacuation. They have the camps surrounded – dozens of North Dakota police and now a small army of National Park Service rangers who are counting down the hours to clear the network of camps behind the Dakota Access Pipeline battle. By 2 p.m. Wednesday, all roads leading into the main Oceti Sakowin camp, named for the Seven Council Fires (or tribes) making up the Great Sioux Nation, will be closed and the last 200 or so people remaining on the historic treaty lands will be ordered to leave. Melaine Stoneman, a Sicangu Lakota woman from Rosebud, South Dakota, is helping organize the exodus of women and as many as 25 children younger than 10 from the camps. Area churches have been secured as shelters. “We kind of felt that the casino wasn’t really a safe place,” Stoneman said, referring to the tribally owned Prairie Knights Casino and Resort, which is swarming with federal rangers. On Sunday, Dennis Banks, co-founder of the American Indian Movement, arrived at the camps in solidarity with the last resisters. Banks spoke of his confidence that the protest could end without incident. “I see today a younger generation saying, ‘Let’s see if we can do it with prayer and peaceful ways,’ and I’m confident that hopefully it’s going to end up that way,” he said. The Standing Rock protest once attracted thousands of people and dozens of celebrities. But so far in its final hours, no signs of outside support have turned up, nor have reporters from major media outlets. In a last-minute video campaign led by a group calling itself the Women of Standing Rock, Cheyenne River Sioux environmentalist Joye Braun reached out to potential reinforcements. By contrast, many have heeded the call to back up law enforcement. A new roadblock has been set up about a mile from the main camp, just south across the reservation border, manned by agents from the Bureau of Indian Affairs. They join Morton County sheriff’s deputies and North Dakota Highway Patrol troopers, who for months have policed protesters in ways many consider overly aggressive. 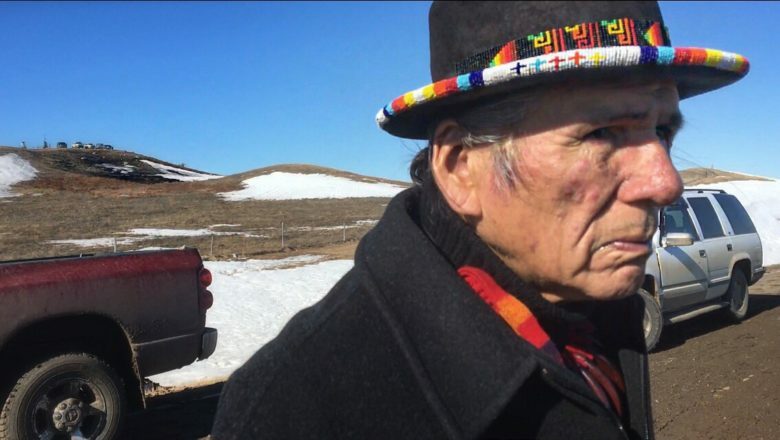 “They bit us with dogs, shot us with water cannons, threw tear gas at us, but we’re still here,” said Cheyenne River Sioux Chairman Harold Frazier. He’s set up a transition camp on private leased land not far from the staging area for the police barricade. Patti Kelly, an older resident of Cannon Ball, led the districtwide resolution for all nonresidents to leave the reservation. She called the campers “a bunch of white rainbow people” during the January tribal council meeting, where her resolution received unanimous approval. What this will mean for campers who have moved onto the reservation remains unclear. Last week, the Bureau of Indian Affairs issued trespassing notices to those living in yurts and tents on tribal property known as the Lean Warrior Allotment. Those living on those unleased lands on the reservation have until Sunday to leave, but there’s concern that law enforcement could move in before then. To allow such forces to remove people from the reservation would send a chilling message at a time when sovereign rights for tribes, under President Donald Trump, are perceived to be under attack. In the final hours, the fight at Standing Rock is becoming a weary one in the 500-year-long struggle of resistance.